(2016-01-06 20:38:57)Whitepro Wrote: This game is too simple, there are only noobs around...backstabbing has never been easier. Have any of you played Team Fortress 2 Classic? It's a really cool mod based off the source that was leaked back in 2008. No hats, only a handful of non-stock weapons, a deathmatch mode that closely resembles Quake... pretty good stuff (although they did sort of mess up rocket jumping in the latest update). Here's their website if you're interested. Unfortunately for me there are no Australian servers, and I just got banned from one of the only active servers for having a pony avatar. I thought it was for "hacking" or something at first (since my ping confines me to the realm of Sniper, and all Snipers = hackers) since the reason they gave for the ban was just "Gas yourself", but as it turns out I found another server that seemed to be where all the people who were banned from that one went and someone explained it to me (it was for having an MLP avatar). Another guy was apparently banned for having someone with a furry avatar on his friends list. (2015-11-01 09:03:42)Nero Wrote: I used to play that game all the time. I'll be so hyped when competitive mode comes by. Not to mention the three admins of the group are also in this group. How does it not look official? As for me, I don't have a mobile phone, and while there is another option in Google Voice, it's only available in the US and Canada. If you don't have a mobile phone but live in the US or Canada and want to try this out though, it might be worth looking into Google Voice and the Steam Desktop Authenticator. I personally do not want to support or endorse the Steam Mobile Authentication system, even by using fake phone numbers/alternative methods, so I will be skipping out on official ranked competitive. That's ok.
My guess as to why it's required is to try and stop players who will use hacks. CS:GO has a paywall similar to the TF2 competitive pass's function, yet the game is still plagued with hackers, and TF2 lacks the Overwatch (is that how it's called?) system. (2016-03-05 01:55:35)Kyukon Wrote: I personally do not want to support or endorse the Steam Mobile Authentication system, even by using fake phone numbers/alternative methods, so I will be skipping out on official ranked competitive. That's ok. I have three Competitive Matchmaking Beta Invites and no one to give them to, so if you want one just add me. Keep in mind you'll still need Premium and the Mobile Authenticator to play. Been playing this game a lot after I got another PC. How's Scream Fortress for you guys? (2018-10-23 02:09:02)Residays Wrote: Been playing this game a lot after I got another PC. TF2 thread bump! Can't believe it's been two years since I last posted here, so much has happened. Scream Fortress has been pretty cool, although I haven't had much time to grind contracts this year. The new community maps I've seen look like some of the best community-made Halloween maps to date, like that one similar to Nucleus (technically the only one I've played, but still). I'm still pretty unhappy with what they've done to most of the bosses, I hate how it forces a truce whenever one spawns. On Eyeaduct and Ghost Fort it's actually torture having to drop everything and fight the boss every few seconds. It'd be cool if there were more bosses like the HHH, I honestly feel like he's the perfect kind of boss for a game like TF2. Non-Halloween-related, last season I joined a team that was keen on sticking together and we've been climbing the ladder pretty fast. We actually have a good chance of winning ozfortress Intermediate this season, which will probably put us in Premier next season. I doubt we'll get very far in Prem since most of us don't have lots of time to spend on the game but it's always been a personal goal of mine to get a taste of the top (as far as Australian TF2 goes, that is). Oh it's very alive. Although some things could be better. "Reworked the votekick system to prevent abuse." "Kicked players no longer can rejoin." 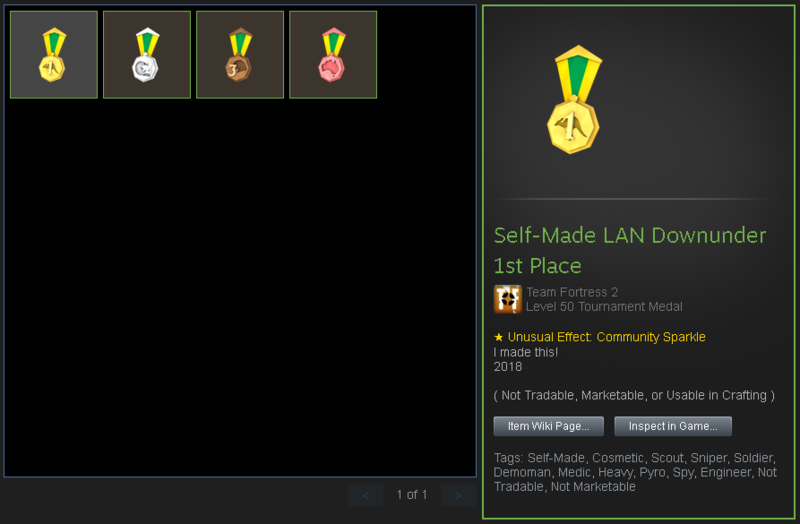 (2019-03-31 00:16:24)Delphinoid Wrote: Self-made badges. Nice. I should learn modelling whenever I get a better computer, if that time ever arrives. Current time: 2019-04-21, 10:06:20 Powered By MyBB 1.8.5, © 2002-2019 MyBB Group.